The pond slider is a common, medium-sized semi-aquatic turtle. There are three subspecies of Trachemys scripta. The most recognizable subspecies is the Trachemys scripta elegans (pictured), which is popular in the pet trade and has been introduced to other parts of the world by people releasing it to the wild. Baby and juvenile pond sliders have a green shell (carapace) and yellow green skin with dark green striped markings. Markings and colors fade in adults to a muted olive green to brown or orange carapace. The carapace is oval and flattened for females, round and complex for males. Tank size is the first critical issue you will have to deal with. A guideline to determine this size used by many keepers, as a minimum, is 10 gallons of tank per each inch of shell length (refer to SCL for correct shell measurement). Therefore, a single adult Trachemys scripta will require anywhere between a 90 to a 120 gallon tank for females and 55-75/90 gallon tank for males. There are more details about appropriate tanks in their own respective section. Click here for details. The top of the tank and basking area should be absolutely inescapable and secure. Aquarium backgrounds are commonly used to prevent the rear, and occasionally, the sides from being transparent. A variety of real and/or fake aquatic plants may add to your turtle’s sense of security. However, live plants will likely be eaten, so it would be wise to choose a plant that is safe for Trachemys scripta to eat. Fake plants may be rearranged, shredded and otherwise uprooted. Python Hiding areas, such as caves, are often used with smaller Trachemys scripta. However, any structure inside the tank must be completely nontoxic, stable and cannot trap a slider. River rocks are large and smooth and easily available. With the assortment of white, grey, black and brown colors and patterns, they add a natural feel and keep maintenance to a minimum. It is important to check each one individually before use to make sure there are no cracks and that they are larger than your turtle’s head. To prevent other injuries, keep the water depth significant enough to avoid the plastron impacting the bottom of the tank. Having a bare tank bottom is fine. It helps keep the water cleaner, allows the filter to be more efficient and allows for easier tank cleaning and water changes. Sand has proven to been very popular. It looks great, and clean up is reported to be not so difficult. Avoid using gravel; it poses the greatest health risk, especially with smaller Trachemys scripta who can experience impaction and prolapse. Water temperature must be accurately monitored and controlled. A submersible water heater is necessary to maintain the preferred water temperature range of 25.5-26.5 ºC (78-80 ºF) for hatchlings and 24-25.5 ºC (75-78 ºF) for adults. To help monitor these temperatures, there are a variety of inexpensive thermometers available made specifically to be used for water. They are all easy to use, inexpensive and having one is absolutely necessary. Do not guess or estimate what the temperature is because it cannot be done consistently or reliably. The required basking area allows for your turtle to dry off and warm up. A heat lamp positioned above the tank will be necessary to raise temperatures an additional 6 ºC (10 ºF). This is also a good spot to add special UVB lighting and direct it over the basking area. UVB rays allow your turtle to produce vitamin D3 which enables the metabolization of dietary calcium. Unobstructed sunlight is the best source of UVB and warmth. If you intend to keep a slider in an outdoor habitat, it will not be necessary to provide artificial UV rays if there is ample sunlight reaching the basking area. Water filtration and quality are also major aspects of a well-maintained environment. Since captive Trachemys scripta eat, sleep and produce waste in the limited amount of water they are in, it is critical to have well-cycled and filtered water. Clean water greatly reduces the instances of infection, algae and fungal growth. The presence and build-up of harmful bacteria and waste should be monitored regularly. A turtle with a SCL of 4″ should be in water at least as deep ensuring that the turtle has a chance to turn itself over if it is upside down. This minimum amount of water is not considered to be adequate for any aquatic turtle and is only listed as a basic safety margin. Ideally, you should use as much water as your tank can safely hold. A tank that is roughly 10 gallons per inch of the turtles SCL is recommended. Therefore, a 4” turtle should be in at least a 40 gallon tank. Waste has a better opportunity to dilute and break down (with the correct filter media) in a greater amount of water. You can check the different types of filtration here. Trachemys scripta are omnivores who can be fed a variety of foods. This variety is important as it enables you to provide a healthy diet. The range of food can include pellets, aquatic plants, vegetables, insects, fish and treats (shrimp, fruit, etc.) as well as the occasional supplement. While it is important to offer variety, it is also important to offer a balanced and nutritional diet that offers additional calcium and vitamins. As with many captive animals, there is a tendency to overfeed them, causing unnecessary and irreversible health risks. Younger Trachemys scripta are generally carnivorous. As they grow larger and older, they become increasingly herbivorous. Being carnivorous means a greater protein intake and young Trachemys scripta should take in a greater percentage of protein than older Trachemys scripta. Sliders of all ages will choose live prey or carrion if the opportunity exists, but it should only be provided occasionally. Trachemys scripta should also be supplied additional calcium to help harden the shell and accommodate growth. The primary diet of a Trachemys scripta should consist of a commercially made pellet, of which there are many types and varieties. With the addition of the appropriate vegetables and calcium, you can provide a balanced diet required for a healthy turtle. It is important to avoid foods that can block calcium absorption. Certain prey, vegetation and treats should be avoided. For example, spinach contains oxalic acid and mealworms have a bad calcium/phosphorus ratio. Either of these can interfere with absorption of calcium. A small portion would not be harmful, but regular and extend use will affect shell and bone development. Trachemys scripta need to be in water to swallow since they do not produce saliva. They may take food that’s on land but will bring it into the water to consume it. Furthermore, feeding a Trachemys scripta in a separate container will create a cleaner tank that will require less frequent cleaning and water changes. Thus, if your turtle cooperates, it would be in a healthier environment and would require less cleaning maintenance. Check out in more detail the feeding section here. Great care should be taken when handling Trachemys scripta. They may be slippery due to their aquatic habitat, resist being held, vocally hiss and empty their bowels. They have sharp claws, strong limbs and a strong bite that can add difficulty during handling. It is recommended that you apply both hands when picking up, moving and holding a slider. Support them beneath their arms, legs and body to provide a more secure and comfortable feeling. The rapid moving of limbs in the air is an indication of stress and should be minimized. Using both hands also provides extra assurance against accidents and falls. Hands should be clean before handling and washed after handling Trachemys scripta and their environment. Cleaning your tank is another frequent aspect of turtle care. White vinegar is a preferred option to clean and remove spots on glass. Bleach and soap should be avoided. Do not use a cleaning agent that contains vinegar; rather use vinegar that is intended for use with food. Placing your turtle in a separate container when feeding will help maintain the water quality in the main tank. This would reduce the number of partial or complete water changes and the amount of filter cleaning. Cleaner water reduces the instances of algae, bacteria and fungus, but water should be regularly changed even if it appears clean. Not all waste is visible and there may be unhealthy levels of ammonia and nitrites present. Maintaining a minimum water level is required to ensure safety from drowning. To avoid a potential drowning, the water level should be greater than your turtle’s straight carapace length. 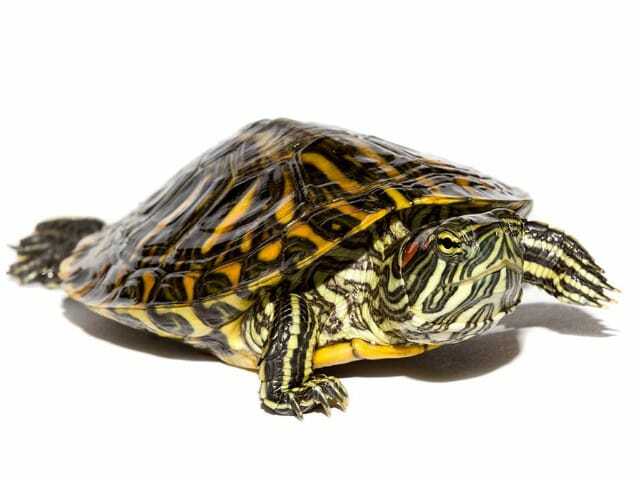 Metabolic bone disease (MBD), also known as soft shell syndrome, should be of serious concern to new turtle keepers and for those with young Trachemys scripta. It is a serious but preventable disease brought on by deficiencies of calcium and/or vitamin D3. Early cases are treatable but advanced cases may be too difficult to overcome. It is possible that MBD may have incurred other diseases due to poor diet and conditions. Respiratory infections (RI) are common and deadly illnesses that affect many captive turtles. It is a contagious illness that can spread to other turtles and often requires medical attention. Improper basking and water temperatures as well as exposure to drafts and breezes greatly increase the chances of contracting RI. There are varying degrees of RI, including pneumonia, and the symptoms may also differ.